Talking about religion can be uncomfortable, but it doesn’t have to be. And most importantly, talking about my Covecrest experience is the perfect opportunity to spread a little bit of God’s love and light to others. I attended Covecrest three times in high school. This past week, I returned for round four, as a chaperone, which was almost even better. I’ve got a few posts from camp coming up, but I wanted to write this one as a general idea of the week and ‘what Catholic summer camp is really like’, because it’s not quite what you might think. The camp itself is set at the base of the Appalachian Mountains in northern Georgia. This makes it the perfect setting for a good ole’ summer camp, just like what you’d imagine. There’s a lake to swim in, hikes through the woods, a scenic waterfall, ropes courses, and a big mud pit for messy games day. There’s also a ‘lodge’ to house the main session room and dining hall, as well as an outdoor amphitheater by the lake (that served as our ‘church without walls’, for the most beautiful outdoor mass I’ve ever experienced), an ‘art barn’ for crafts, and so much more. 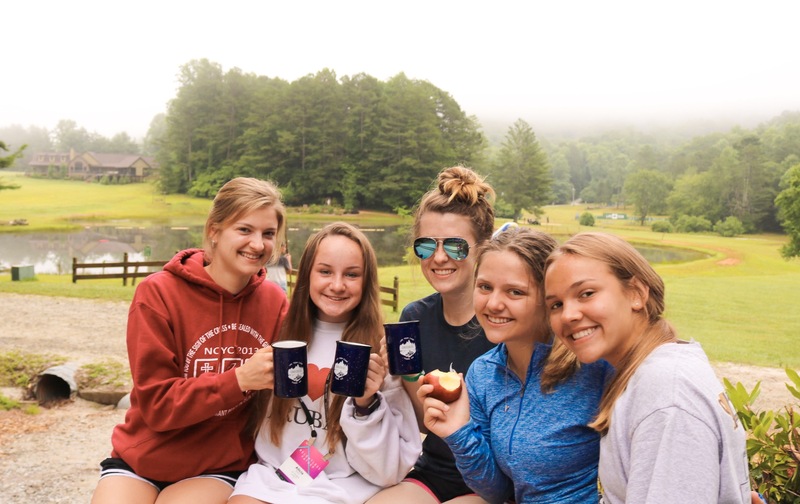 While the mission of Life Teen is ‘leading teens closer to Christ’, and the camp does include lots of prayer time, daily mass, adoration, and Christian speakers, the camp also challenges campers physically and mentally. Every day of camp, there’s some outdoor activity (white water rafting, zip lining, hiking, etc.) balanced with faith time. While the camp is Christ-centered, I can assure you we do much more than ‘sitting inside and praying’. And in a beautiful way, lots of the praying doesn’t happen ‘sitting inside’ at all. But rather, we prayed from rafts on the Chattooga River. We prayed from the mountain top. We prayed anywhere and everywhere. And we didn’t have to be sitting inside to do it. The amazing thing about our God is that He’s not just present in church. He’s everywhere. That’s what Covecrest is about. Encountering God anywhere and praying to God everywhere. God is always with us, and He is always ready to meet us exactly where we’re at. It’s about rejoicing and dancing around a fire pit, covered in mud and soaked from the river, but then quieting our hearts and singing along to the live worship music under the stars. It’s about coming to God in our mess (be it mud, or dirt, or sin), acknowledging our many sins, and letting Him love us anyway. It’s about challenging ourselves to see ourselves, and each other, the way God sees us: as His beloved, chosen children. It’s about pushing ourselves out of our comfort zone, to be uncomfortable in the best possible ways, because that’s where the best things happen. It’s about growing in faith, friendship, and closeness to a God that wants nothing more than to be close to us. So, yeah, I did go to camp and ‘pray inside’, but those aren’t the moments I remember when I think about camp. I remember going to daily mass outside and feeling closer to God than I usually would in a church, and I’m not even outdoorsy. I remember feeling so truly at peace after going to confession (also outside, in the middle of a field) and having all my sins and failures washed away. I remember seeing Christ’s light and love shine through the campers, chaperones, staff and just about everyone I encountered that week. I remember singing along to worship music and being aware of nothing more than what was going on in that moment. I remember God feeling just as close to us through the ropes courses as He was in mass. I remember my teens looking up to me for advice and wisdom, while still feeling so, so small compared to God’s great love. I remember four years at the #bestcampever that only gets better with time. That’s what Catholic summer camp is really like. It’s about being real, messy, forgiven, broken, and sometimes, just plain hot-sweaty-and-tired, and knowing God loves you anyway. It’s so difficult to put into words the incredible experience that is Covecrest, but I hope this post helped unpack a small piece of what the camp is really about. I’ve got a few more Covecrest-inspired posts coming soon, but in the meantime, be sure to subscribe below and follow me on social media. Thanks for being here. Blessings, my friend! Hi Kristen! What a great job describing this incredible experience! Thank you for serving Christ over this past week with your YES! May God continue to bless and keep you a witness to His Relentless Love!